Who Are the Real Authors of 'Porgy and Bess'? There’s a cheeky scene in Born Yesterday, George Cukor’s Americanized upending of Pygmalion,that casts light on the thinking behind the marquee at the Richard Rodgers Theatre on Broadway this season. About a third of the way into the Cukor film, William Holden, on assignment to instill class in Judy Holiday, takes her to the symphony. “What's the name of this number, did you say?” she asks him. “Beethoven’s Second Symphony, Opus Thirty-Six,” he answers. In the years since Born Yesterday, the trend in classical music has been to avoid titling works with the names of their composers, in favor of colorful titles such as The Face of the Night, the Heart of the Dark (by Wayne Peterson) and On the Transmigration of Souls (by John Adams). The Judy Holiday philosophy of titling has prevailed, preserving a distinction between the guy or gal who made the thing up and the thing itself. Except, that is, when the name of the author has strategic value, as it has in the adaptation of Porgy and Bess that opened last week on Broadway. Under the directive of the estates of composer George Gershwin and his brother Ira, who contributed to the lyrics written primarily by Dubose and Dorothy Heyward, the new staging of the work has been named The Gershwins’ Porgy and Bess. 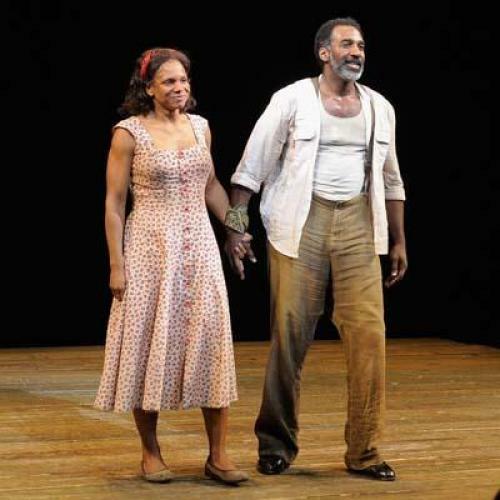 Not Porgy and Bess, as it had been named in all its permutations—opera, Broadway musical, and film (directed by Otto Preminger)—since 1935; now it is The Gershwins’ Porgy and Bess. Trimmed and tweaked, the show has new scenes of dialogue by the playwright Suzan-Lori Parks, and music revised and rearranged for a Broadway pit orchestra by the composer Deidre L. Murray. The result, I think, is potent and appealing, and Audra McDonald is unshakable as a more complicated Bess. Still, the show is not the monumental work of opera that George Gershwin composed. Nor was it ever solely the Gershwin brothers’ creation. Dubose Heyward not only wrote the original Porgy novel and dramatic play; with his wife Dorothy, Heyward wrote the bulk of Porgy and Bess's most elegiac lyrics and the entirety of its libretto. “Summertime, and the livin’ in easy. Fish are jumpin’, and the cotton is high…” So wrote Dubose Heyward. The Gershwins’ Porgy and Bess is far from the Gershwins’ alone, and it’s not precisely Porgy and Bess, though it’s something legitimate and fine. It is practically a truism today that the presence of an author’s name in a title is sign of questionable authorship. Paul McCartney’s Liverpool Oratorio: That’s the formal title of the work, which is also credited to (and copyrighted in the names of) two composers, McCartney and Carl Davis. Sidney Sheldon’s After the Darkness: Written by Tilly Bagshawe. Then again, this has been true since the days of Socrates, as I recall from reading a work called Plato's Republic.